Alizée Art : The winner of Danse avec les stars, season 4: Alizée! It’s Monday evening, supposedly 45 hours since the end of the finals of Danse avec les stars (season 4), yet I have slept only 3 hours… since Saturday morning… The excitement, the stress, the joy, the fears & the tears have just been overwhelming. It’s hard to believe that this is even true and not just a dream. Venit, vidit, vicit as you would put it in Latin, she came, she saw, she conquered! Alizée did what everyone was dreaming for but too afraid to said out loud, to not to jinx it. After nine hard weeks of learning, practicing, dancing, and competing. After being injured several times, after bursting in the tears of the joy and the sadness, after all the stress that we can only begin to imagine, she did what was thought to be almost impossible… She won the fourth season of Danse avec les stars! It wasn’t an easy victory. She had to fight till the very end, from the very beginning. An hour before the show started, she got injured once again! She had muscle strain on her neck/shoulder and needed to get doctor’s permission to be able to dance the Saturday night. Thankfully she got it but unfortunately it didn’t take the pain away. While off the cameras, she was always holding an ice bag on the injury. While trying to wrap into warm clothes to try to stay warm for able to dance. Thankfully everyone was supporting her. Once again she was the first to dance for the night, the most feared position for her. It’s never easy to be the first one, we had seen that already. Even this time, it may have cost her some points. Her first dance was Cha-Cha-Cha, danced on Scream & Shout by Will.I.Am featuring Britney Spears. Dressed all in gold, maybe it was a good sign of upcoming, after all. The dance wasn’t quite perfect. It had the energy, but it lacked something. It would have been excellent dance for any other prime show but this was finals, it would had to be perfect. But I believe that this is where being the first to dance hit her. It’s just isn’t easy to be the first. She scored rather nice 68 points, but unfortunately it wasn’t enough and both Brahim Zaibat and Laetitia Milot was able to score higher with their dances. Alizée was the last in leaderboard, first time ever. First the injury, now this… not a good start for the night. I started to fear the worst. Would this be the way it goes through the night? After the dance, critics and scores, Alizée rushed to change her outfit. She did not even have time to give interview on the backstage like she often did in earlier shows. It was time to get ready for Megamix, the second dance of the night. The special dance of the night. All three couples danced at the same time, dressed the same way, and performed the very same choreography. This was about accuracy and dancing skills. Thankfully Alizée did great, one could argue that she did the best. The judges saw it slightly different though. Her dance was solid and she was able to get the second best score (34 points) after Brahim’s highest score of 37 points. Laetitia was left for the last place, the order had been restored to what it used to be through out the season. After the two dances, Alizée and Laetitia shared the same place with equal scores but it was already easy to see who would get better scores at the end. She got her faith back with this dance. She was back to her normal routine. After Megamix, there was absolute no time to slow down! After the scores were given to her, she literally rushed out of the stage to change her outfit. During this, she probably did the world record of changing clothes. On camera recording backstage action, we were able to see her rushing down the stairs in one dress, disappearing from the image for 1 minute and 11 seconds, and she was already climbing the stairs back to the stage in a different dress! She had to hurry because she would dance the next, it was time for her and Grégoire Lyonnet to perform their third dance. The third dance was Rumba. We have seen Alizée & Grégoire to dance this already several times, once with Candice as a third wheel. Every time they have perfected it so the hopes were high. However, it would be slightly different this time. It would be all about Alizée. Grégoire would be there with her but would take minimal part in the choreography. It was Alizée’s time to show what she has learned during the season. The music was chosen to be Pas toi from Jean-Jacques Goldman, but this was cover version of Tal, her best friend (after Grégoire?) during the Danse avec les stars adventure. Was it all the emotions what the earlier rumbas have brought to her, was it Tal singin, or something else… She was amazingly sensual, every move as smooth as a silk, every move in perfect synchronization with the music and with Grégoire, with absolutely no errors to see. She left no-one cold. Not even the judges. All four of them, stood up to applaud. They were clearly moved by the performance. It was hard to keep my eyes dry, if I even succeed. Shy’m was speechless, Marie-Claude Pietragalla didn’t have much to add to that, Jean-Marc Généreux, after standing up again, was able to get few words out of his mouth and call it perfection. Chris Marques, well, was moved. Which alone meant more than any note they ever could give. While listening to their few words, you could see Alizée shaking when listening to them, on the border to burst in tears of all the emotions. It was easy to tell that this would be Alizée’s best scoring performance ever. Easily. Against all the fairness, she finally scored only 79 points out of 80. Chris just couldn’t anything on his nature and gave only 9 for the technical skills. 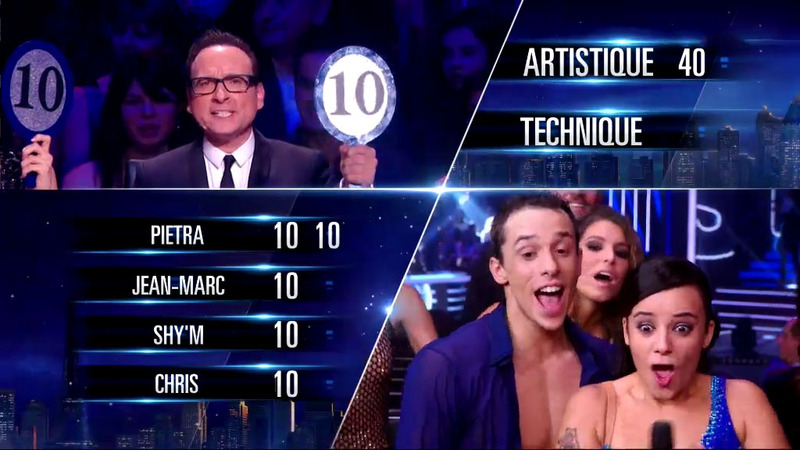 Alizée & Grégoire would have deserved perfect score, it was a perfect dance. But even now, the dance will be remembered. It is the highest scoring dance during the season, one single point left from perfect score. After her performance, Laetitia was against the wall, how could you compete against something like that? She couldn’t. She did a sold dance but it did not belong to the same show, scoring 63 points. Brahim, known for his perfect technique, scored his personal best also with 76 points, leaving no doubt who two couple were beyond the others this season. The most stressing point was just about to come… One couple would be eliminated and would not get to dance the last dance. This is all about how the audience voted, what they thought. Only the two most loved couples would continue… After 3 minutes of painful waiting game, the hosts first announces Brahim Zaibat, who continues to the final dance. It is Alizée versus Laetitia now… I can feel my nails hurting my palms, you could cut the tension with a knife. After one more painful minute, we finally hear the words we were waiting for: Alizée & Grégoire, you continue to the final dance! Laetitia is eliminated! It is Brahim versus Alizée now! Alizée can’t control herself anymore, she in so truly happy. She is one step away from the dream! After a little break, the final dances starts. The order has been changed, it’s Brahim’s turn to be the first dancer. The fourth and the final dance is Freestyle. The couple was able to choose their own style, their own music. This would tell their story, to show their skills, their chemistry, their view of the perfect dance. While Brahim’s dance was more than excellent, it wasn’t perfect. Although, it was mostly his partner Katrina who couldn’t quite stay at the level of Brahim. It just lacked the final touch throught the dance. Surely it was well received, and they could be proud of everything they did till the very end. The judges agree with it, even though this last dance would not be scored. It would be all about the audience votes to decide the final results of the competition. After Barhim, it was Alizée’s & Grégoire’s turn. The final touch to finish these finals, to finish this season. Behind the eyes of the TV viewers, Alizée was getting warm-up rub from Jean-Marc Généreux for her injured neck, to be able to dance this final dance. Was it his magic touch but when the dance finally started, she was on fire! They had chosen very beautiful song, One, an unknown cover version of U2‘s famous song, and for the style they had chosen contemporary dance. The story would tell the story of Alizée & Grégoire, the two months they have known each other. The dance was simply beautiful, absolutely amazing. It wasn’t anymore a couple dancing, they had become one. The most beautiful performance of the season, the perfect end for the season. The judges got lucky, they would not have to rate this dance, no-one saw ever the need to manufacture the notes higher than the 10 what they had already used for her earlier dance… This one was off the scale! Like Chris Marques it described: oui, oui, oui, oui! The season could not have gotten better end for it! Alizée was absolutely touched by the words of the judges! But the worst was ahead… The wait for the public votes. The votes that would decide everything. We had the two best couple, by large margin, standing in front of us and only one of them could win the competition. While fearing the worst and hoping the best, I had to close my eyes, pressing my finger nails once again to my palms, if not through them. Waiting to hear the results… peaking time to time to see if it had already happened… The next moment I see Alizée in the air, screaming of happiness, the hosts repeating her name! She won! Alizée won Danse avec les stars! The dream came true! But it’s almost impossible to believe! But the final votes tells they story, Alizée managed to get 55% of the audience votes against 45% for Brahim. Alizée really was the winner! She had done it! After that everything is blurry… The emotions going up and down while trying to gasp what really just happened. The wait was over, there would be no more setbacks. No-one could take this away anymore! She won! Maybe now you understand why it’s been 47 hours (yes, it took 2 hours to write this) with almost no dream at all… All the excitement, you just don’t have time nor need for sleep! It will take days to fully comprehend and swallow the reality. And I’m not in hurry, I will celebrate! Party goes on! This was my story, my view of the finals. Hope you liked it as much as I did.